There seems to be no common name for the genus Ectemnius, al least not in English. All British members are simply referred to as Solitary Wasps. All Ectemnius species are rather big wasps in the familiar colours of black and yellow. 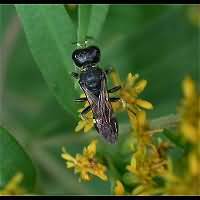 Belonging to the Digger Wasps, they do not dig in sand, but in soft wood instead. Most species live in the moderate climate zone and in Europe some 25 species have been seen. In Britain 10 species have been recorded. Of all species Ectemnius continuus is the most common one, found all over Europe, including much of Scandinavia. Females are hard to identify, for they are very similar to other species. Males can be identified by the long thorns on the tarsus of the middle foot. Males grow to a length of 8 to 12mm, females are a bit longer: 10 to 15mm. Ectemnius continuus is on the wing from May to the end of September. The female makes a nest in dead wood. She will use a stem, a dead tree, a fallen tree or even a dead twig. She digs a central tunnel, which ends in some cells, sometimes as many as ten. Each cell will contain one egg and six to eight immobilised prey, all flies. Ectemnius continuus hunts for almost all bigger flies and will happily attack House Flies, Flesh Flies, Hover Flies, Dagger Flies etc. Ectemnius continuus is a very common species all over England and Wales. Northwards getting scarcer, like in Scotland. Is also known to make nests in fences and does inhabit villages and cities as well.